Got company coming this festive season? Now’s the time (or so my grandma tells me) to start preparing. Whether you’ve got an army to feed or just a couple of hungry house guests, it’s good practice to give your recipes a test-drive before the big day. Why not start with Gordon Ramsay’s smoked salmon parcels with fennel and apple salad? After all, in a season of indulgence, it’s best to stock the cupboard with the healthy ingredients first for guilt-free sampling. To make the parcels, line small espresso cups or ramekins (approx. 80ml capacity) with strips of salmon. Allow a little of the salmon to drape over the edge of the cups – these pieces will then fold over the mixture to close the parcel. Finely chop the excess salmon trimmings and place in a mixing bowl. Add the cream cheese, crème fraiche, horseradish, lemon zest and chives. Season with salt and pepper and mix well. Spoon into a piping bag and carefully pipe into the middle of each espresso cup. Fold the salmon edges back over the mixture to close the parcel. Cover with cling film and place in the fridge until ready to serve. Finely slice the fennel and place in a large mixing bowl. Grate in the apple (with the skin), being careful to avoid the core. Add the capers and 3 tbsp chopped parsley. Pour in the extra virgin olive oil, and the juice of ½ the lemon. Season with salt and pepper. To serve, place the palm of one hand over the top of an espresso cup, turn upside down and shake the parcel out (it may be easier to release if first you use the tips of your fingers to very carefully pull the salmon away from the inside of the cup). 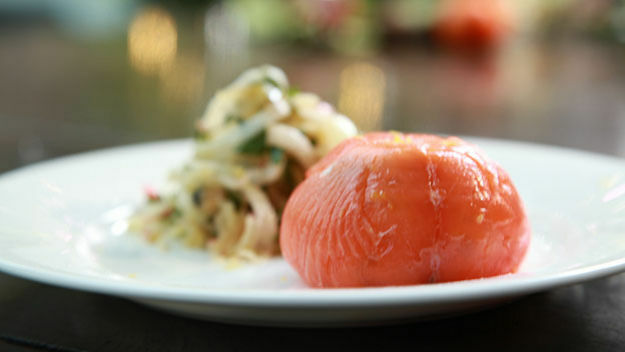 Lay the smoked salmon parcel on your serving plate and arrange some fennel salad to the side. Add a final sprinkling of lemon zest and a squeeze of lemon juice to the salmon. Garnish with extra parsley if desired. Vote for your favourite at our Festival of Trees!